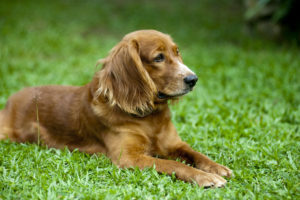 Many canine breeds are susceptible to digestive issues. The size of your canine companion can play a part in this, as well. It seems that many very large dogs, as well as many very small dogs have digestive issues. If your furry friend is having some tummy troubles, the following tips can help you figure out what is going on and how to help your fur baby feel better. It is always helpful to get the advice of a trusted veterinarian. Many dog parents prefer to try a few home remedies first. However, if your dog’s digestive issues worsen, you should make an appointment with the veterinarian. If your canine companion is experiencing any of the below signs of digestive issues, a vet appointment is recommended. When in doubt, ask your veterinarian! If you are unsure if these digestive issues are really a problem, or if your dog is just having an off day, call your vet’s office and explain why you are concerned. They can suggest a plan of action. Many times, the answer to tummy troubles may be as simple as a change of food. Sometimes a particular food just won’t agree with your pooch’s stomach. If you recently switched brands or types of food, this is probably the cause of your dog’s tummy problems. Even if your pet has been eating the same food for years, this could also be the culprit. Once in a while, a dog food company will add or remove ingredients, or completely change the formula of a food. For more information on your dog’s current brand of food, or to choose a new one that might work better for his dietary needs, visit DogFoodAdvisor online. Pet food is not the only type of food that can upset your pet’s stomach. Fido can sneak into the trash when you aren’t home, or steal a table scrap when you get up for a glass of water. The scraps of food eaten throughout the day can easily cause temporary digestive issues. If your pet is unable to get these troubling foods out of their system, make an appointment with your veterinarian. Another way to help reduce tummy upset in your best friend is to add a supplement to their diet. Sometimes, commercially prepared pet foods just don’t have everything a dog needs to live up to his potential and enjoy good health. Choose a supplement that is made of human grade ingredients, and is manufactured in the United States to help your dog’s systems function properly. One supplement that works well and gets great reviews from dog parents is NuVet Plus. NuVet Plus works to support your pet’s overall health from the inside out, and can help improve digestion. For more information on NuVet Plus, including a list of NuVet ingredients and real-life stories from dog parents like you, visit us online. You can also place an order for the NuVet Plus wafers or powder at https://www.nuvet.com/products.html. Your pet deserves the best you can provide, and NuVet Plus can help you do that. Visit NuVet on Twitter to learn more. There are several types of animals that must have daily exercise to keep their digestive system functioning properly. Horses, in particular, are very prone to digestive troubles if they aren’t up and moving enough. Did you know that this can also have an impact on your dog? Helping Fido’s tummy can be as easy as incorporating one or two short walks into his daily routine. It’s a win for both of you – he gets the exercise he needs, and you get some fresh air and sunshine. As an added bonus, both of you might lose a pound or two and make some friends in the neighborhood in the process. Hopefully the tips above will help you care for your furry friend! For more information about Fido, and how to optimize canine health, visit the NuVetonline blog. Your dog is your pride and joy, which means you probably want him to have a healthy skin and coat. Regular trips to the grooming salon and frequent baths can ensure that your dog smells wonderful and looks adorable. Yet, you may be able to go a step further. The right pet food can naturally improve the appearance of your dog’s coat. The food you choose for your pet will have an impact on their skin and coat. You just have to know which food to choose in order to maximize the benefits! Believe it or not, a diet with a little bit of fat in it will go a long way in improving the health of your dog’s skin and coat. However, not all fats are created equal. It’s important to choose a pet food with healthy fats. Wild salmon is filled with omega-3 fatty acids, which is an example of a healthy fats! It may be tempting to opt for a less expensive dog food. However, keep in mind that low-quality food may contain more filler products than actual nutritious ingredients. To ensure your pet is receiving all of the necessary nutrients for a healthy and shiny skin and coat, consider investing in a pet nutritional supplement like NuVet Plus. You can also provide your pet with various types of dog food and alternate the main protein. A dog who enjoys only chicken-based dog food will not get all of the essential fatty acids needed to have healthy skin and a shiny coat. If you’re making yourself some breakfast, don’t be afraid to scramble some eggs for Fido! Eggs are filled with high-quality protein and contain zinc, which is important for skin health. Check the ingredient list on the back of your dog’s food to see if Omega-6 is included. Omega-6 is an ingredient that can help boost the shine of your dog’s coat and give it that lustrous appearance you are hoping for. If you can, choose a high-quality food that provides your dog with a nutritious and balanced diet. A high-quality pet food will list a protein as the first ingredient — such as chicken, fish or beef. If the pet food you currently use lists a grain ingredient first, it may be time to consider a different option. Choosing the right pet food is an easy way to help the appearance of your dog’s coat. You can make even greater strides in improving your dog’s appearance by adding a pet nutritional supplement to their diet. A high-quality nutritional supplement, such as NuVet Plus, can help fill in the nutritional gaps. Many of the human-grade ingredients in NuVet Plus can help to improve the health of your dog’s skin, as well as the appearance of its coat. In addition, this supplement helps to boost your pet’s immune system. Find out more about how NuVet Plus can help improve your dog’s appearance and health by visiting https://nuvetonline.com/nuvetplus/ today.